Back in November, after 6 months of working on other projects, I picked up development for the EV-Point Mobile App again. The app is built using React Native and is available on both iOS and Android. As Xcode got a new major release (from Xcode 9 to Xcode 10) since my last time working on the project I figured I’d trigger a new build on Bitrise, then see which errors would came at me, and continue from thereon. What I didn’t know however is that it would eventually take me 3 days, 17 failed builds, lots of Google Fu, and some guesswork to get everything working again. Here’s an overview of the biggest hurdles that I had to take, along with their solutions. I hope they might help you too. My initial plan was to first get the current version of the app – still running React Native 0.53.3 – to build again in Xcode 10, and only then upgrade the React Native version to the latest one (0.57.4 at the time of writing). During the course of my journey I eventually flipped that around, as React Native 0.57.x already contained some fixes that I was in need of. As I stumbled from one build error into the other (locally, of course) and tried fixing these one by one, I eventually found that the most easy solution would be to upgrade to the latest RN version (0.57.4 at the time of writing) as it already contained most of the fixes. To upgrade to the latest RN version I used react-native-git-upgrade. I didn’t immediately jump from RN 0.53 to RN 0.57 though, but gradually went through all intermediate releases. 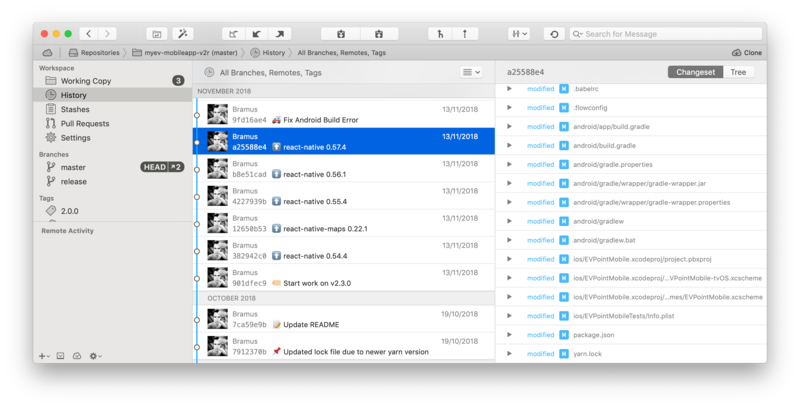 Once I performed all upgrades I tried building my app locally and … yes, great succes! UPDATE: This is fixed with the release of React Native 0.57.5 (#277c19c). You can skip this step if you’re running 0.57.5 or newer. Turns out that there was an issue with third party scripts not getting installed correctly. Locally they were, however. FYI: Locally it worked fine because – as it turns out – a second build would correctly struggle through it. As Bitrise always starts from scratch (e.g. with a non-existing node_modules folder) it couldn’t make it through. I’ve added this step right before Bitrise’s Certificate and Profile Installer step. 💡You’ll also need to execute this step locally, especially when starting from scratch. You can safely add this script to your local build-script as it contains a built-in check to not double install the Third Party Scripts in case they are already present. // Fix for "Program type already present: android.support.v4.app.ActionBarDrawerToggle$DelegateProvider"
- Required com.android.build.api.attributes.BuildTypeAttr &apos;preview&apos; and found incompatible value &apos;debug&apos;. - Found com.android.build.api.attributes.VariantAttr &apos;debug&apos; but wasn&apos;t required. - Required com.android.build.gradle.internal.dependency.AndroidTypeAttr &apos;Aar&apos; and found compatible value &apos;Aar&apos;. - Required org.gradle.usage &apos;java-api&apos; and found compatible value &apos;java-api&apos;. - Required org.gradle.usage &apos;java-api&apos; and found incompatible value &apos;java-runtime&apos;. - Required com.android.build.api.attributes.BuildTypeAttr &apos;preview&apos; and found incompatible value &apos;release&apos;. - Found com.android.build.api.attributes.VariantAttr &apos;release&apos; but wasn&apos;t required. The final Android problem I encountered was that dependencies would not properly compile anymore with the change to Gradle 4. Packaged like react-native-config and react-native-devsettings-android would fail on their verifyReleaseResources step. Thankfully packages like react-native-config have already landed fixes for this issue. Merely upgrading your affected dependencies using yarn will fix it. Furthermore I have a few classic issues – such as signing certificates that were expired – which I had to tackle. Supposedly the release of RN 0.58 – which I’m looking forward to – should no longer require the adjustment mentioned above. What’s new in the upcoming PHP 7.4? What program do you use for the builds (the first image)?